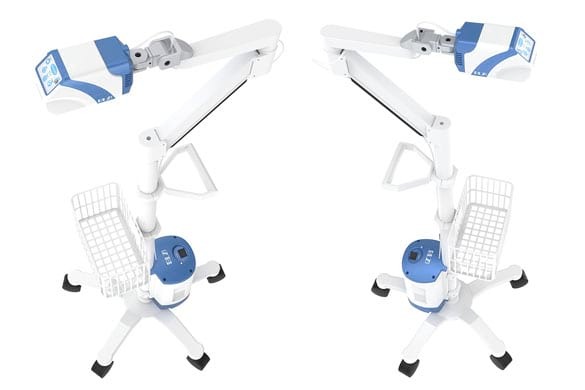 VS200 is the mobile version of VeinSight™ series of vascular imaging navigation instruments; The products adopt the design of mobile chassis so that the support structure can easily move; The products carry large capaciy of Lithium battery compartment to achieve long life. VS200 type of products are designed specially aiming to health care staff having mobile requirements and the mobile chassis of the bracket is stable and firm; Also accessories, such as personalized pushing hands and storage basket, etc. are equipped; Hover bracket for universal position and multi-joint adjustable mechanisms are equipped with features, for example high flexibility and easy to operate and so on. We suggest the products to be used in medical environments such as wards and emergency rooms, etc. with mobile requirements. The main body of VS200 type-mobile angiography instruments consists of five parts, including host part, Lithium compartment, power adapter, hover bracket and mobile chassis.